Alabama dental plans are both readily available and affordable IF you know what to look for when you’re ready to buy a plan. There are two different types of dental plans available both in Alabama and nationwide. These are either dental insurance or dental discount plans. Both provide a less expensive means of protection against paying the full cost of dental care, however, that’s where most of the similarities end. You should be aware of the two options before you buy any type of dental plan because one is unquestionably superior over the other. Let’s take a look at the two types of dental plans. Most dental care provided by these plans is what’s known as “maintenance oriented”. This means that routine preventive care like cleanings, flouride treatments, fillings and other basic types of preventive maintenance oral care should be covered in most plans. The biggest mistake that most consumers make here is that they’re under the impression that dental “insurance” will cover them if they need major dental work done right away. This is absolutely incorrect. Example, let’s say that you have a bad tooth ache and you need to get it taken care of. You visit the dentist and are told that you need a root canal. You find out that the cost is several hundred dollars and you don’t want to pay full price so you decide to buy dental insurance. This is where you’ll get a rude awakening because dental insurance does NOT cover pre-existing conditions. This means that any existing caries (cavities), pain or any other problem that you had when you walked in the door is NOT covered. Also, you must pay regular premiums just like any other insurance policy AND you’ll also have to pay a deductible on most types of dental care. In other words, even though you have a dental insurance plan you’ll still be paying for most of your procedures out of your own pocket, at least until you’ve owned the policy for many months and even then you may only be covered for a percentage of your care. Discount Dental Plans are simply an inexpensive alternative to insurance that actually gives you better options. The reason for this is because discount plans aren’t insurance, so you don’t have to worry about pre-existing conditions being covered. Most of these plans offer savings of 10%-60% on everyday routine dental work and offer huge savings on major dental care like dentures, bridges, root canals and more. There are no exclusions, no age limits, very little paperwork and no hassles to be seen by a participating dentist. The only thing that you must be prepared for when using a discount dental card is to pay cash at the time of the visit. These dentists are providing huge discounts in exchange for not having to go through the hassle of processing insurance paperwork and waiting 45 days or more for their money or setting up payment plans. It’s cash on the barrelhead, it’s work done by professional, it’s BIG savings and it’s a “win-win” for everyone involved. The cost of joining one of these plans is very affordable too. Plans run as low as $79.95 annually for an individual. This cost does vary for each plan. For a limited time you can save an additional 10% off the cost of joining by entering the coupon code >> JE10 after you’ve selected a plan and are checking out. Although savings are pretty standard throughout the state in major cities like Huntsville, Mobile, Birmingham and Montgomery, you may want to check your area of Alabama by entering your zip code in the blue box above or simply click here >> Same Money On Dental Care! 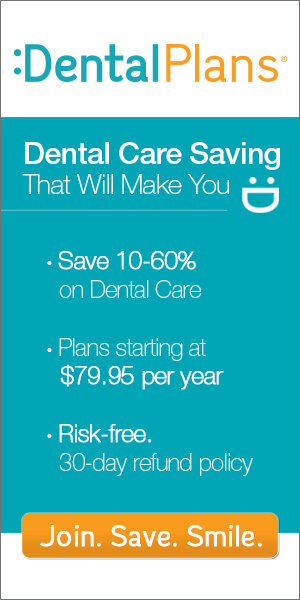 Go ahead and do it right now and you can start saving on all of your dental care needs within 1-3 days!